﻿ Luxury Holiday Villa for rent in Latchi / Neo Chorio, Paphos, Cyprus - Villa Xanthi! Welcome to Villa Xanthi Web Page! Click here to view photos gallery! The area is great for trekking, mountain biking, diving and water sports, eating out or just relaxing in the quiet surroundings. The villa lies next to Akamas National Park where you can spot species native only to this region and Cyprus, wander for hours on nature trails, enjoy wooded picnic sites and visit Lara beach where the sea turtles Caretta caretta come to lay their eggs. All necessities can be found in the village, including traditional coffee shops and taverns offering authentic Cypriot food. For banks and a more extensive selection of shops, fish restaurants and taverns, you can drive to the nearby Latchi and Polis Chrysochous. Latchi has some of the best fish restaurants on the island and Polis is a lively town with cosmopolitan bars, clubs and restaurants. There are also several beaches in the area, most offering various facilities and water sports. Driving around the area, you can find traditional villages where the original architecture has been preserved. Elevated from the pool and garden the front door opens into a bright and airy open plan lounge, dining and kitchen area. Left is the lounge with inviting soft furnishings, a feature fireplace and breathtaking panoramic views from the bay windows. The large dining table stands opposite the front door and comfortably seats eight guests. The kitchen area is fully fitted with all modern stainless steel appliances, dark wood units and there is a wide range of kitchen utensils catering for most culinary needs. There is also a round wooden table with four chairs. The dining area is between the living room and the kitchen with a large dining table that stands opposite the front door and comfortably seats eight guests. There are sliding patio doors that open onto a large raised veranda equipped for alfresco dining and a pool/billiard table, leading down to the pool area. The kitchen has also a back door for access to the side and rear of the villa. A twin bedroom and separate bathroom with toilet and shower room is also on this level. A magnificent marble split level staircase leads upstairs to the other tree spacious bedrooms of the property. There is a master bedroom with en suite bathroom and corner bathtub with a shower. There is also a double bedroom with en suite bathroom and half bath with shower. Both rooms have access through patio doors onto an outdoor terrace for relaxing moments and spectacular views. There is also a twin bedroom with en suite bathroom and shower. On this level there is also a small kitchenette equipped with its own sink and small refrigerator. All the rooms have their own wardrobes (equipped with digital safe box in the master room), bedside tables with table lamps and hair dryers. In the master and double room there is also a chest of drawers with mirror. All bedrooms are air conditioned and heated. The use of Air-conditioning/heating is FREE with no extra cost! Outdoors, the pool terrace is elegantly paved and fenced providing a very private sunbathing terrace. Around the large private pool there are sun loungers with umbrellas and an outdoor shower. Next to the pool there is a shaded pergola with a picnic table and perfectly designed barbeque area. The pool is heated. The heating of the pool is FREE with no extra cost! Bedroom 1 - One Double-size bed, a/c unit, wardrobe, mirror chest, two bedside tables. Bedroom 2 - One Double-size bed, a/c unit, wardrobe, mirror chest, two bedside tables. Bedroom 3 - Two Single beds, a/c unit, wardrobe, two bedside tables. Bedroom 4 - Two Single beds, a/c unit, wardrobe, two bedside tables. The normal number of guests in the house are 8 persons sleeping in 4 bedrooms. The maximm number of guests are 9 (8 adults and 1 little children). We applied the policy of only 2 adults sleeping in each bedroom! There is a portable baby bed/playpen which can be placed inside any room in the house. Bathroom 1 - Toilet, Sink with mirror, dual voltage shaver socket, corner tub with shower. Bathroom 2 - Toilet, Sink with mirror, dual voltage shaver socket, half bath with shower. Bathroom 3 - Toilet, Sink with mirror, dual voltage shaver socket, bath with shower. Bathroom 4 - Toilet, Sink with mirror, dual voltage shaver socket, bath with shower. Please observe the same level of security as you do at home. Do not leave doors and windows unlocked whilst you are away from the Villa and even if in the Villa if you are by the pool! Villa is regularly maintained by a team comprising of a maid, gardener/pool man and the villa owner who oversees the property. The owner will usually visit two times a week, which includes your arrival day, unless stated otherwise. The times of hours may vary, as may the number of hours worked. Their duties are to make the beds, clean the floors and bathrooms and to do a limited amount of light cleaning. Towels should be changed twice weekly and bed linen once per week. It is important that the gardener/pool man and maid carry out their duties to look after the villa and, due to their work loads, the times of their visits cannot be fixed and may not always be convenient to everyone. We kindly ask for your co-operation when they visit. The Troodos mountains are located in the centre of the island. The higher mountain is called Olympos and its top is called Hionistra. Hionistra has a height of 1952 meters (6404 feet). Pentadaktilos, the other mountain-chain in Cyprus is located in the north Cyprus. This rocky five finger mountain rises 700 meters above sea level and harbours the legend of the Byzantine hero Digenis, who defeated the invading Arabs with supernatural strength. Ease of Access: Cyprus is a destination that is well served by the major airline carriers and airports of Europe. 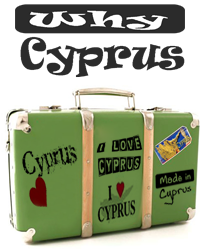 With a flight time of less than five hours from the UK and Ireland to Larnaca and Paphos Airport, it has never been more affordable and easier to get to Cyprus! Research: When going someplace where you haven't been before, make sure you don't offend anyone by mistake. Reading up a bit can save you from cultural faux-pas that can cost you money, or can simply ruin your holiday mood.